The GSM-1000-BMX connects up to 35 BACnet devices to a BACnet/IP or BACnet Ethernet backbone. Its optional capabilities make it to a highly flexible multi-device. A complimentary powerful BACnet browser allows to discover, test, debug and monitor any BACnet network as well as to read/write any properties of a BACnet device. 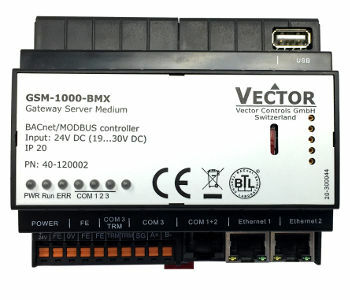 The Vector GSM-1000-BMX is designed as a high power server for connection to Ethernet bus systems.